I love the Farmer’s Market! It’s my favorite part of the week! This year, my husband and I have decided that we are going to try some new things (and continue to enjoy the old). We plan on choosing one thing each week from the market and cooking it a variety of ways. This week we picked up some Kohlrabi for the first time. All I have to say is yum! We tried it raw and sous vide (my husband is currently all about sous viding everything). Both were delicious; the raw was crunchy and mildly radishy, while the sous vide was kind of potatoey. Either way, we will definitely be eating more. On another note, pea season is just beginning and I couldn’t be happier. Fresh peas are perhaps my absolute favorite food. Sadly they are only good for a few weeks year…which gives me a great excuse to overindulge on them while I can. 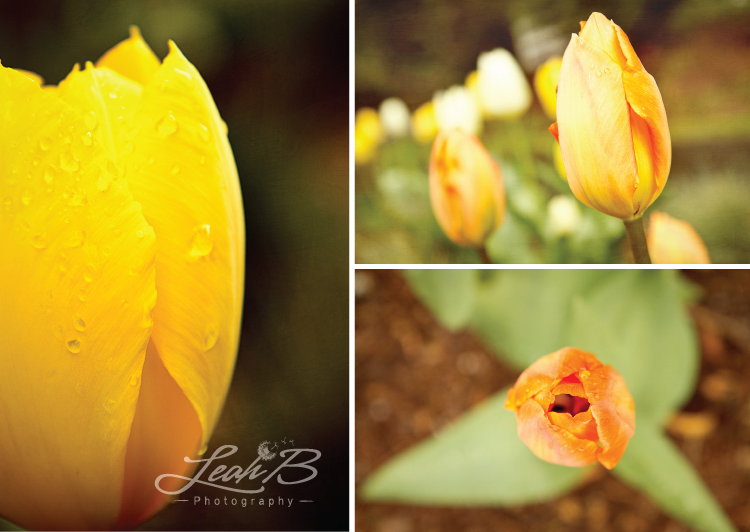 I had hoped to post these photos while the tulips were still in full bloom, but alas the season has already passed. It never ceases to amaze me how quickly time seems to pass. Spring just started, but we’re already heading into summer. A year ago, we had just moved into our new house and I was preparing to head home to Vermont for six weeks to prep for our wedding. It simultaneously feels like yesterday and a lifetime ago. My mother grew up on a farm and is no slouch in the garden herself. I’ve learned in my adult years how I took for granted all the fresh berries and vegetables that I always had at my fingertips. I, however, have yet to keep a plant alive for more than a season. (Although, my husband did manage to salvage last year’s sage, which was all but dead, and is now thriving again). So far, gardening has not proven to be an innate ability passed down through the generations. Still, I will continue to try. This weekend we planted our first tomato plant and have a new set of herbs growing on the windowsill. It’s a start; maybe someday we’ll have a garden half as impressive as my family. I’ve been talking a lot lately about ways to share my day-to-day photography and designs. Starting a blog was the first step; the next challenge is to find other ways of presenting my art (perhaps some notecards? )…Oh and to maintain the blog, that’s a challenge in and of itself. Two posts down, hopefully many more to go. I’ve been thinking for a while about starting a blog. Although I’ve never been much of a writer, I hope to have an outlet to share my photography and perhaps a random thought or two. It’s nerve racking, but I’ve recently been inspired to put myself out there and see what happens. A few weeks ago one of my childhood mentors passed away. She was the mother of one of my dearest friends; she was the vibrant, warm-hearted, always surprising women that welcomed me into their home with open arms. And she was the first person to ever acknowledge that what I do with a camera could be art. Viola Moriarty inspired many people in her life, and continues to do so even though she’s no longer with us. In the days after her death, my creative side was restless. How could I even begin to honor this woman? I went for a long walk with my camera. The rain had just stopped and the light was beautiful; I came home with a series of images that I was proud of, something I hadn’t felt in a while. And so, with this inspiring woman in my thoughts, and with her daughter’s encouragement, I humbly begin my first blog.